Big is usually better !!!! - As designers / engineers we are always striving to create a competative edge for ourselves and our customers. By making use of the large bed-sizes on our numerous 3 and 5 axis machines - Multiple nesting is an extremely competative way of manufacturing components, drill jigs and even tooling details / features. 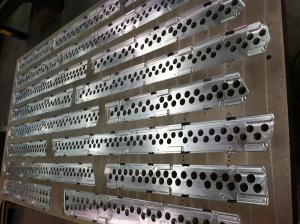 Concentric Drill Jigs - Produced in batches of 20 off.